NGVAmerica has released its 2017 Annual Report, highlighting how the national organization is leading on initiatives to grow the natural gas vehicle industry and helping its members accomplish their business goals. The 2017 Annual Report shows how NGVAmerica continues to lead efforts to advance the industry. 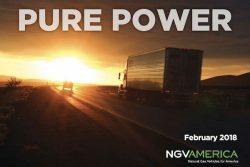 Several crucial policy wins were achieved in the Congress and state capitols, and NGVAmerica also took on new efforts to advance critical safety and technology issues and strengthened programs to communicate the strong value of natural gas as a transportation fuel. Source: NGVAmerica – Natural Gas Vehicles for America trade association, an affiliate of NGV Global.